Xtend was recently reformulated to dramatically improve taste and ingredient solubility - Xtend is now spoon-mixible - and to provide added functionality for workouts or events under the most grueling of conditions. Xtend is available in 6 mouth-watering, refreshing fruit flavors to make every workout an incredible one. A: Two university studies suggest that Xtend is significantly effective at increasing muscle mass and strength, and reducing body fat when consumed during exercise or immediately prior to and after training. * It's recommended that you begin consuming Xtend immediately prior to, and continue sipping on Xtend throughout your training or competition. Many users also report significantly improved gains when Xtend is consumed immediately upon waking-up in the morning and/or sipping on Xtend throughout the day. A: For best mixing results and taste, pour 8 fluid ounces of filtered water into a shaker cup. Add 1 scoop of Xtend. Cover or close the shaker cup. Swirl the shaker to create a vortex effect and draw the Xtend powder into solution. Then, once the Xtend powder has fallen into solution, shake vigorously for about 25 shakes. Enjoy! For endurance athletes that may add Xtend to their hydration pack, it is recommended that Xtend be mixed in a shaker cup or pitcher and then poured into the hydration pack (as opposed to mixing directly within the hydration pack, as doing so may cause the hydration tubing to become blocked). NOTE: If you find that some of the BCAA material settles at the bottom of the shaker cup, you may not have used the correct dilution ratio of 1 scoop of Xtend per 8 fluid ounce of water. A: Not only do each of the individual ingredients used in Xtend have an incredibly high dosing threshold of safety and many years of validated clinical trials to support safety across a wide range of consumers, but Xtend did not adversely affect any measures of safety in either of the two clinical studies in which it was used chronically and at high doses for up to 10 weeks. Additionally, each batch of Xtend undergoes rigorous quality assurance and analytical testing to validate ingredient purity and potency, and is blended and packaged in an NSF for SportÂ® certified facility to ensure no banned substances are inadvertently introduced into the manufacturing process while producing Xtend. A: In both 8-week & 10-week clinical trials, under no or weight-reducing calorie restricted diets, respectively, Xtend has significantly outperformed Whey Protein, Carbohydrates and a 4:1 (Carb-to-Protein) sports beverage on measures of lean body mass, body fat, upper- and lower-body muscular endurance, and upper- and lower-body strength. * Within the physique and anaerobic sports nutrition industry, competitive products are either under-dosed, contain irrelevant ingredients included more for a label effect than a physiological one, or are so ignorantly formulated as to wonder what species' metabolism the company's R&D personnel believes to be their core audience. During exercise beverages for the endurance world, on the other hand, still depend too heavily on simple carbohydrates or, when amino acids are included, generally use low doses of a whey protein concentrate that yield only a fraction of the key amino acids and introduce unnecessary lactose and fat into a high-performance environment. 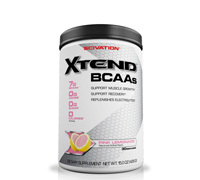 Directions: As a dietary supplement, mix one serving (one level scoop) of Scivation Xtend™ per 8 ozs. of water. Stir or shake and consume during exercise on training days, or throughout the day on non-training days.